On the day before the busiest travel day in America, right at the start of rush hour, an Amtrak train became disabled outside one of the North River Tunnels in New Jersey. Crews cleared the track within a half hour, but in the end, the disabled car set off an all too familiar chain reaction that ultimately left the busiest train station in America in disarray. The posted delays for NJ Transit trains were up to 45 minutes behind schedule, that is, if you could fit onto the overcrowded trains in the first place. Concourses and platforms were swamped with annoyed commuters. To make matters worse, because of the disorder, police checked passengers’ tickets at every platform entrance, which caused even more disruptions and delays. Meanwhile, across the Hudson River, in Hoboken—a city of just 50,000—train after train bound for New Jersey’s suburbs departed on-time and under capacity. Most New Jersey residents do not even consider Hoboken as a stop along their daily commute for work. After all, commuters traveling to Hoboken must transfer to either a ferry or the PATH train just to get into Manhattan, let alone their final destination. As a result, Penn Station serves over five-times as many daily New Jersey commuters as Hoboken. This discrepancy in ridership, while obvious, does not reflect the relatively comparable number of trains that travel in and out of Hoboken each day. 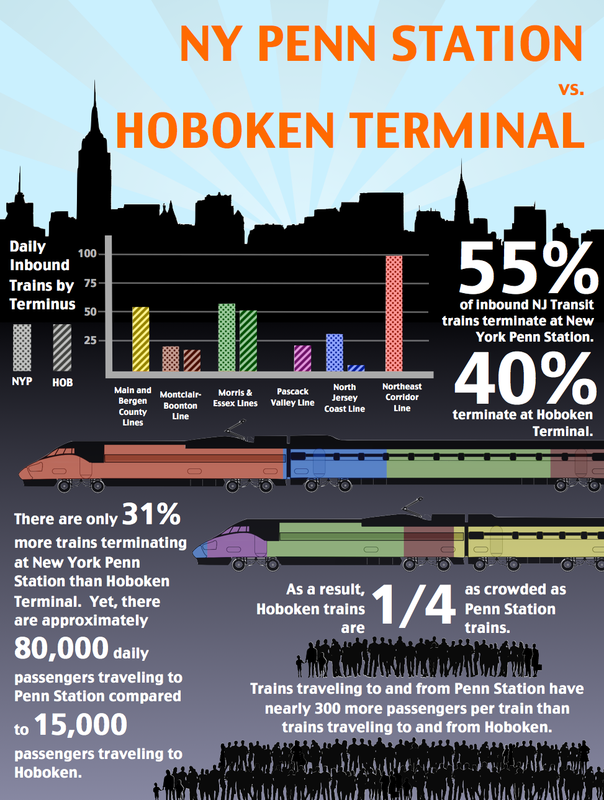 Of the nearly 400 daily trains to New Jersey, over 40% of these trains originate in Hoboken as opposed to Penn Station. The bottom line: every week, hundreds of NJ Transit trains originating or terminating in Hoboken are underused despite the fact that they serve (or have the capability to serve) almost all of the same destinations as NJ Transit trains originating or terminating in Penn Station. 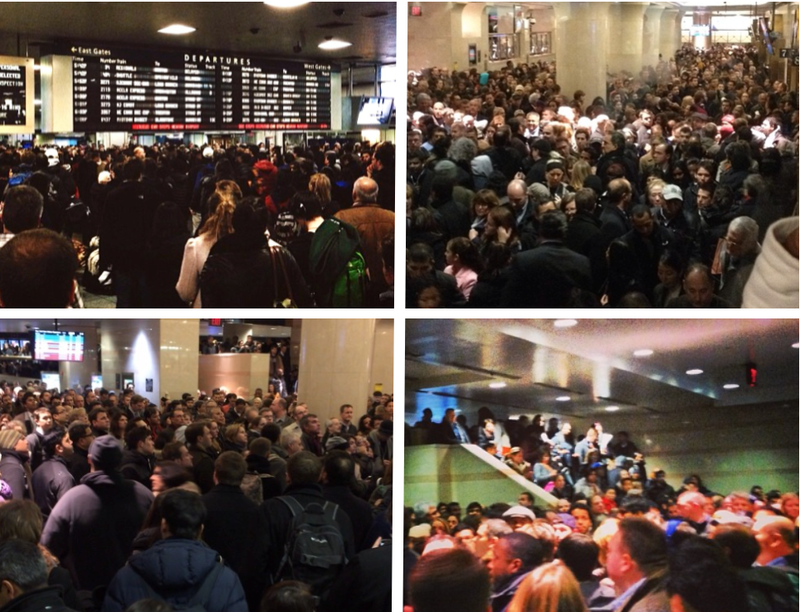 As long as NJ Transit riders are beholden to Penn Station, incidents like the kind that occurred on November 26, 2013 will continue to disrupt the commutes of tens of thousands of NJ Transit riders. Hoboken, on the hand, offers a solution. Unlike Penn Station’s North River Tunnels, which are shared by NJ Transit and Amtrak, Hoboken has double the inbound and outbound trackage capacity dedicated exclusively to NJ Transit trains. These tracks travel to the banks of the Hudson River and already serve a substantial number of NJ Transit’s daily trains. What NJ Transit is missing, however, is a tunnel under the Hudson River and an alternative commuter terminus in Manhattan. While this may seem like a tall order, it is also a necessary step in order to fix the problems associated with relying solely on Penn Station for direct access to Manhattan. It is imperative that New Jersey residents have a greater diversity of choice when it comes to commuting by rail into New York City. With more than ten times the New Jersey-bound passengers as Amtrak, NJ Transit riders suffer more than anyone else when there are delays in Penn Station. In the aftermath of Hurricane Sandy, the problems associated with a lack of adequate cross-Hudson access were on full display as service remained limited for close to a month after the initial storm. But as NJ Transit ridership grows, incidents like the one that occurred on November 26, 2013 are likely to become more commonplace. As to the question of who, if anyone, is at fault for days like November 26, 2013, many riders are quick to cast blame on NJ Transit, and their frustration is not necessarily misplaced. 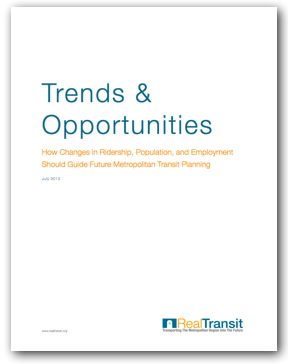 As public transit has become a more inviting option for daily commuters, numerous transit agencies have made it a priority to increase capacity to meet demand. New York City is expanding the subway to Manhattan’s West Side and up Second Avenue. The MTA is constructing an alternative LIRR station underneath Grand Central Terminal and has put forth preliminary plans to bring Metro-North trains into Penn Station. 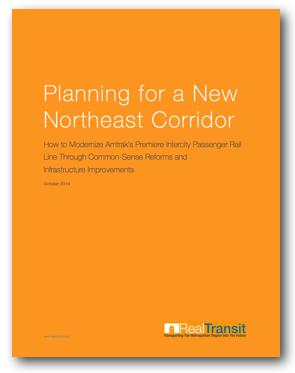 Even Amtrak has moved forward on proposals to improve the Northeast Corridor. Yet, NJ Transit has no plans of any kind to address the real challenges that lie ahead for its tens of millions of annual passengers commuting to New York City. In addition, the leading regional transit proposals on the table today do little to ease Penn Station’s capacity constraints for NJ Transit and, in some cases, amplify these problems. For example, the additional concourse space created by Phase I of the Moynihan Station project is estimated to accommodate only 900 NJ Transit passengers during peak hours. Yet, over the period of time needed to complete this phase of construction, the number of passengers using existing concourse space is estimated to increase by over 7,000. Further, despite its large size and scope, Phase II of Moynihan Station will not create any new NJ Transit concourse space. Amtrak’s Gateway Project similarly fails to seriously address the problems associated with overcrowding and delay in Penn Station. 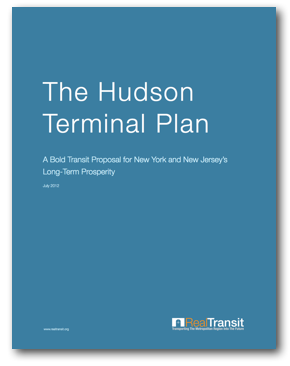 Real Transit’s Hudson Terminal Plan suggests the extension of Hoboken’s four feeder tracks to a new NJ Transit station in Manhattan. 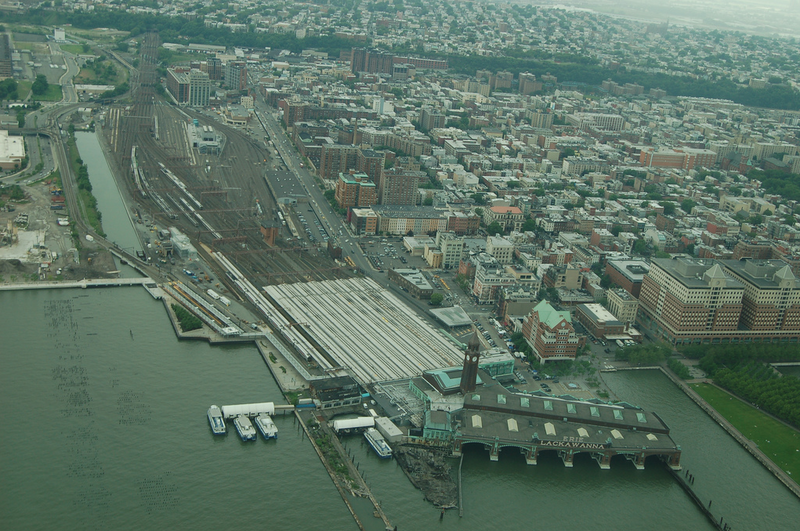 However, competing regional transit proposals should also strive to diversify the location of future Hudson River rail crossings and incorporate the extensive, yet underutilized rail infrastructure in Hoboken. 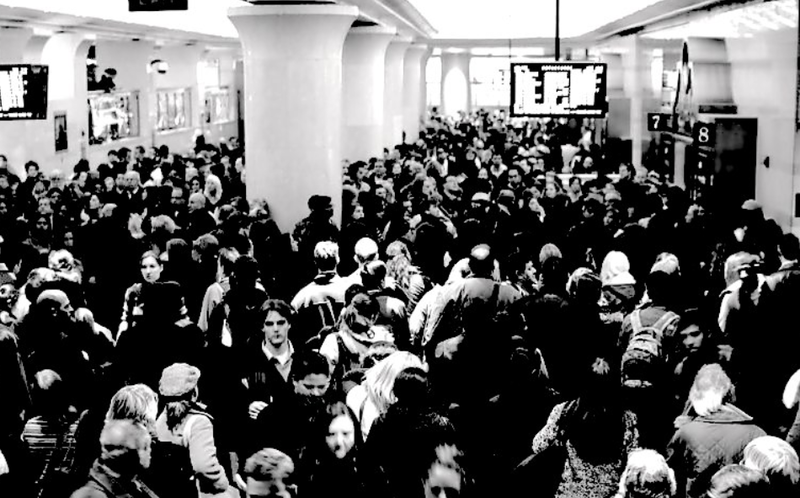 Only when NJ Transit commuters have the option to travel to an alternative rail station in Manhattan will the overcrowding and delays in Penn Station diminish. Until that happens, unmanageable and potentially dangerous situations, like the incident that occurred on November 26, 2013, will continue to plague Penn Station and its passengers.